War Plan replaces the Mission Command Table interface for War Campaign missions, showing available and in-progress missions, as well as champion and troop details on one page. You can choose from groups suggested War Plan or create your own, and easily plan out groups for multiple missions. If you experience problems, or would like to request a feature, please use the Issues tracker. To start a mission with a suggested group immediately, left-click the group button. To tentatively save a suggested group for the mission, right-click the group button. Members of tentative groups will not be suggested for other missions. To create your own groups, left-click on the Champions and Troops you want to include in your group. The suggested groups will refresh to include the Champions or Troops you select. War Plan only handles War Campaign missions. 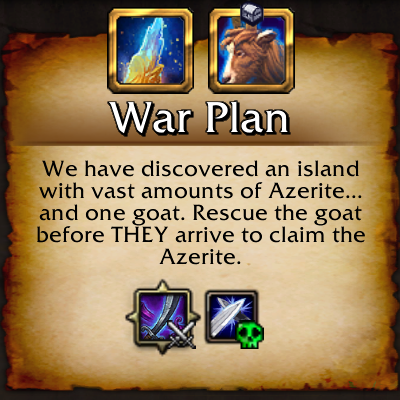 For Garrison Missions, you could try Master Plan.